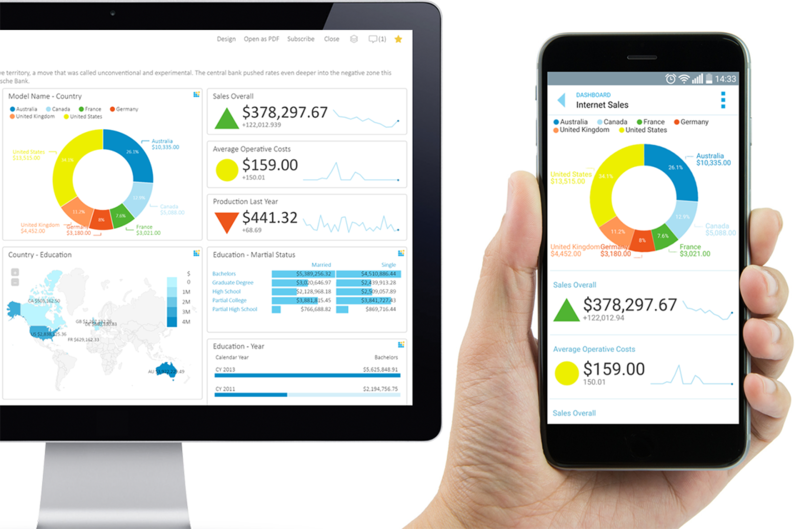 Prepared Dashboards based on SQL and OLAP data can be accessed using mobile devices and mobile user interface to visualize and analyze data in real time. Mobile BI with Kyubit software is accessible using modern web technologies (HTML5, CSS3) and mobile web browsers. All Dashboards and dashboard folders created within 'Kyubit Business Intelligence' web application are available to connect from mobile devices using Windows (Active Directory) credentials of the current user. User is authorized to see exact same Dashboard objects and data as with classic view of Kyubit BI application. Kyubit Mobile BI can be used internally to access data from mobile devices on local intranet and wireless connection or Kyubit application can be exposed externally on the web and users can reach their local business data from anywhere. 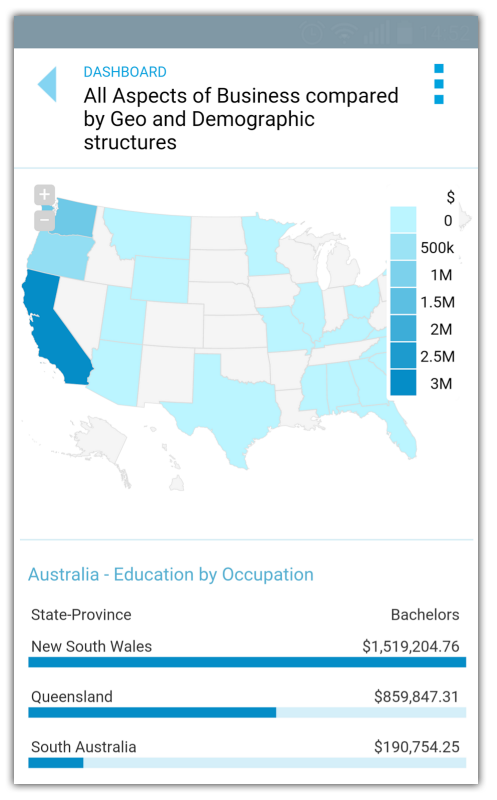 Perform OLAP analysis Drill-Down and Drill-through actions to find more in-depth details of your data with touch of your fingers from Dashboards Mobile BI view. Select OLAP dimension level to Drill current data with multiple Drill-Down steps or get back to previous state of analysis. Select predefined Drill-through action that will return row details of the current OLAP visualization. Touch chart segment you would like to explore with new details (Drill). Select OLAP action: Drill-by, Drill-Down or Drill-Through. Select OLAP dimension to drill. 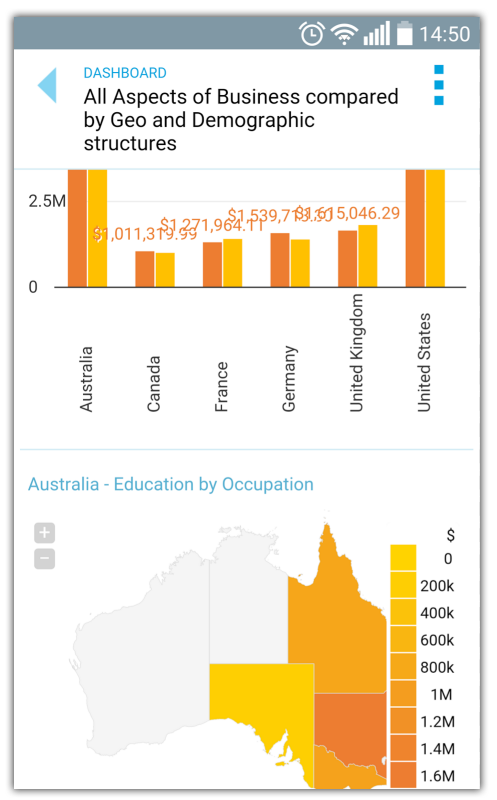 Chart on the dashboards mobile view transforms to display drill down dimension level. Repeat this step multiple time to reach analysis data of interest. 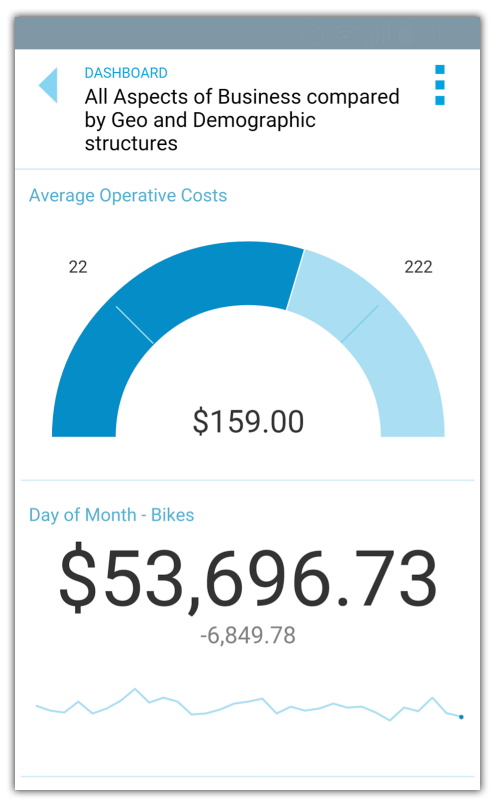 All dashboard visualizations available at dashboard design-time will be rendered on mobile devices with all custom display options defined while designing dashboard. 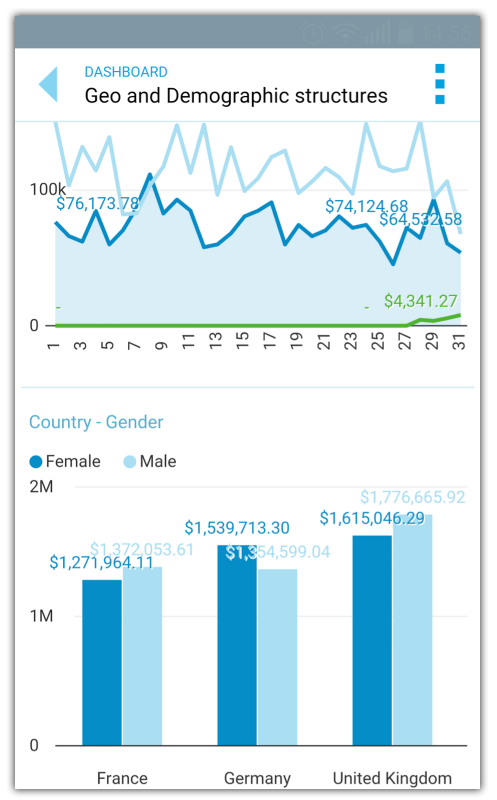 Visual options and data settings like, Color Theme Pallets, Value Labels, Average/Trend lines and others will behave same on mobile BI and desktop view of the dashboard. For each dashboard tile user can select chart visualization and option to 'Show Values' to see pure values that are base for chart visualization. OLAP data chart visualizations have option to 'Drill-Through' data for specific chart segment to see all leaf-level details that are related to chart segment of interest. First time you will need to enter your Windows (Active Directory) credentials to access web application. 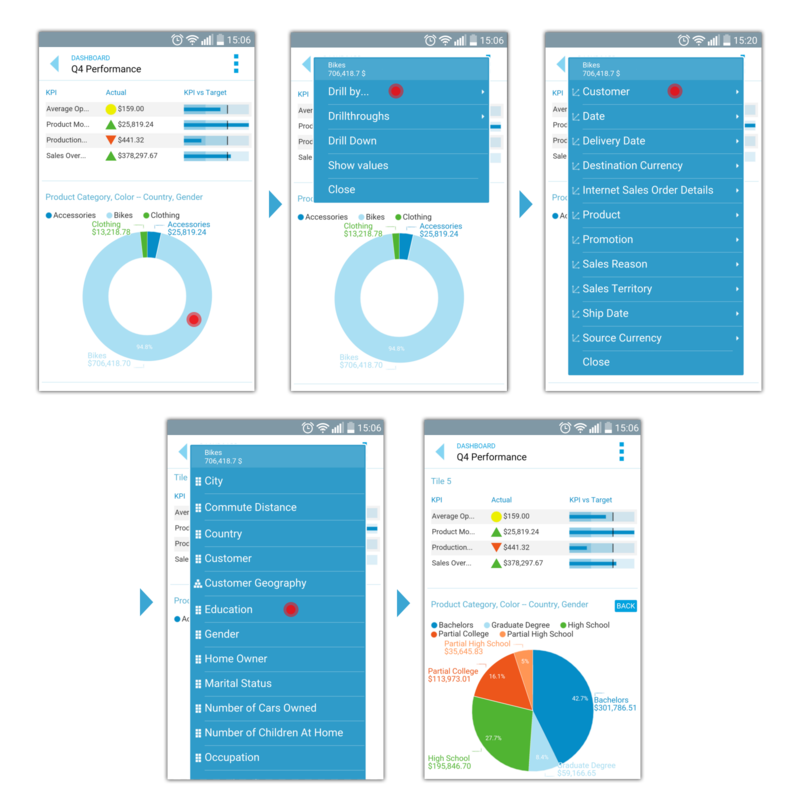 Download 30 days evaluation of 'Kyubit Business Intelligence' and see Kyubit Mobile BI software features in action. It is a simple and quick installation that will bring all features unlocked in evaluation version. We will be happy to receive your feedback and inquiries. Download 'Kyubit Business Intelligence - User Manuals' which covers all aspects of 'Kyubit Business Intelligence' Mobile BI usage.